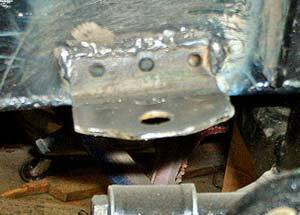 T-Bird Restoration: Part 12 — We Do The Brakes! We continually work on two or three "sub-systems" of a project, usually one going on in the garage and the other in the inside workshop. Doing so provides a way to keep from getting burned out on one task (losing patience means poor quality work) and also keeps the project going when bad weather makes us disinclined to go into the garage. In addition, the heated, well-lighted waist-level benches in the workshop lend themselves to precision work like instrument repair, upholstery, etc. While the body "smoothing" was ongoing (face it: this part of restoration seems to never end) we decided to tackle the brake system. Doing so would give us a break in the monotony, not to mention an opportunity to test-drive the car on the driveway and cul-de-sac on the first nice day of early spring. 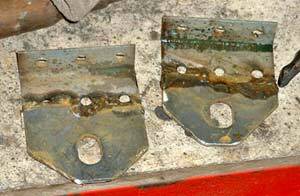 Besides, the brake work should always be done before painting to insure against spilling fluid on the finish. Huh? That's right, we had previously decided to relocate the battery into the trunk because the new master cylinder's ('71 Corvette) hydraulic lines would intrude on the space too much. Also, we wanted to use the space to mount a pressure gauge for the AOD (to facilitate ongoing adjustments to the throttle valve, where failure to do so results in death to the transmission) and mounting areas for the rear brake proportioning valve and line connections. 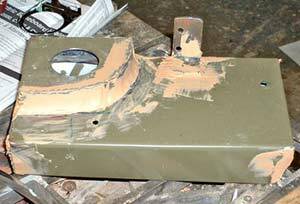 We took the time to construct a metal platform specifically designed for these items, which would be mounted to the original battery plate. Using thick sheet metal from an old furnace housing we measured, bent and welded up a nice, two-level platform, on which we welded the bracket for the proportioning valve. This is the almost-finished platform before the filler was sanded and the assembly painted. 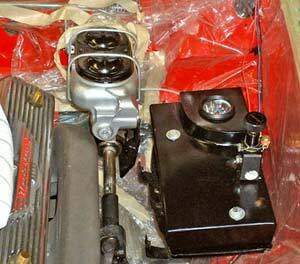 The platform is installed in the car, with pressure gauge and proportioning valve mounted in place. We bought generic 3/16ths inner diameter brake lines in a number of lengths (12", 20", 36", 48", 60") from the local auto parts store, along with some union fittings, a tee fitting and reducing fittings to mount the lines to the master cylinder. We also bought some 5/16ths lines/fittings to run the gas line from the new tank to the engine area, since both brake and fuel lines run together along the frame. Total cost for the stuff was about $100, far less than buying pre-bent lines from a restoration supplier. Besides, the pre-made stuff wouldn't fit our new front-disc system anyway. We carefully routed long lines down the left side of the frame and onward to the differential's flexible hose connection. We hand-bent the line as it changed direction and made sure the union fittings were tightened properly. The connection to the differential flexible hose was made as well (the brake lines on the rear end housing that go to the wheel drums were installed when we rebuilt the rear end). 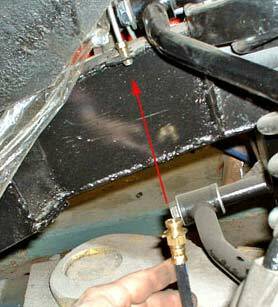 We then bent and routed the fuel line from the tank, alongside the brake line. We made some fittings to fix the lines to the frame and drilled holes for sheet metal screws to hold them in. 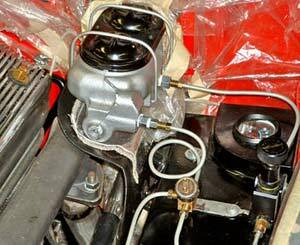 The lines are nicely dressed to the master cylinder and the pressure gauge is in full view. The lines are neatly affixed to the frame and out of harm's way. Now, To Connect The Front Wh... Whoops! It had to happen, of course, and it did when we attempted to connect the newly-acquired front wheel flexible hoses to the lines. 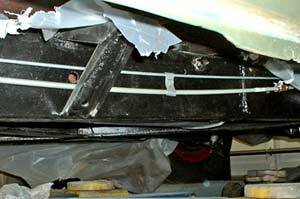 We had routed the lines to the original bracket locations on the frame but failed to realize that the flexible hoses were too short (by 5 inches) to reach the connection. We could have searched for new, longer flexible hoses, but - the longer they are the mushier the pedal pressure - so we opted to make new brackets. We had lots of pieces of heavy metal plate around, so we fashioned two new brackets and welded them to the frame in the proper locations. This added about an hour to the project and we had to wait overnight for the paint to dry, but it was the best approach. Now this is a predicament! On to Plan B. These brackets will be plenty strong. We thought about using silicone brake fluid but our experience with the stuff has taught us that the car's brake system components can be "sensitive" to it. Spongy pedal feel often results, especially when the lines are small diameter. We instead opted for synthetic brake fluid, a relatively new form of conventional fluid. It has the added property of being less sensitive to absorbing water and that's really the main disadvantage of brake fluid, so why not try it? 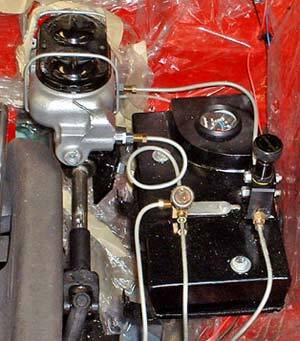 We loaded fluid into the master cylinder and started pumping it through the system, first to the right rear wheel and then worked each wheel cylinder in turn. Since we plan an article strictly devoted to brake system bleeding later we won't go through all the steps here. Suffice to say that once the system was bled we had a nice, firm brake pedal and were confident that we could easily stop the car on its first test drive. You might have noticed that the master cylinder sits very, very close to the exhaust manifold. Thunderbirds were notorious for overheated master cylinders and batteries due to this design feature, so a metal heat shield was fitted to the original battery tray in the production cars. We decided to get a bigger piece of heavy sheet metal and form our own heat shield to protect the master cylinder. We made it to fit the original shield's mounting tabs on the battery tray and curved it to mimic the shape of the master cylinder. After powder coating the piece we riveted a sheet of Kevlar heat shield cloth to the inside and mounted the assembly. It should do the trick. The finished brake system, complete with heat shield.